The glassiness of Inle Lake is something I won’t forget. If you go to Myanmar, you’ve got to take a boat around this lake for amazing photos of the unique life of the Intha. 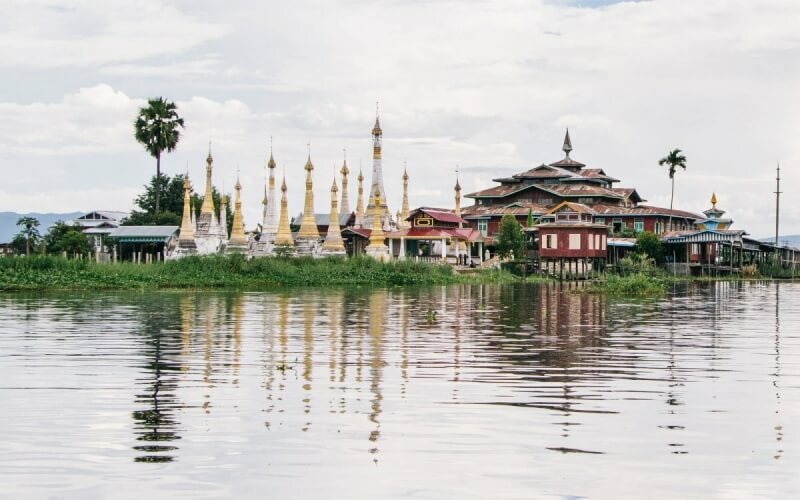 Inle Lake is a huge lake in the Shan State of Myanmar. 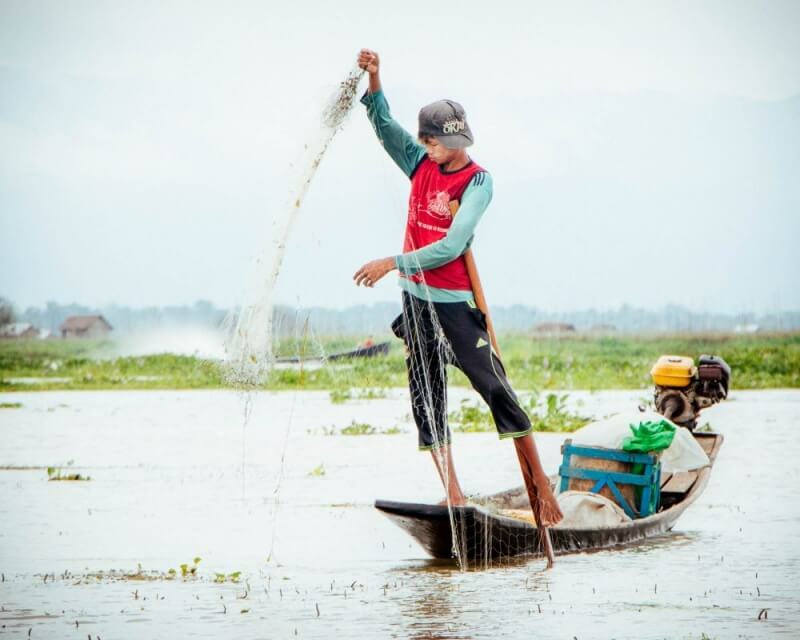 The fisherman of Inle Lake are famous for their unusual leg rowing but the lake itself has so much more going on. 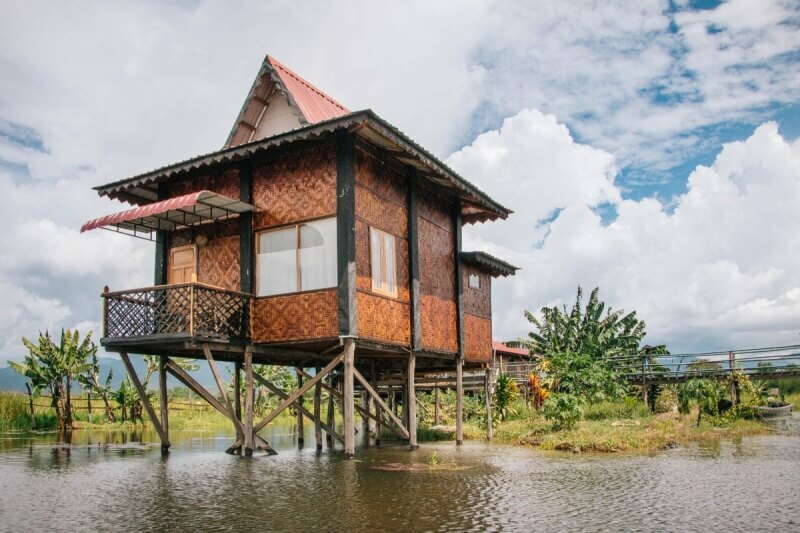 There are homes on the water all built on stilts. There are lotus weavers, silversmiths, blacksmiths, restaurants, again all on stilts. There are even gardens and farms built on floating beds. Everyone boats around from spot to spot. There are literally no roads here, instead there are paths through the floating plants. I know, it sounds like I’m making this up! So let’s get to the photography and you’ll see. Best time of day Once it gets dark, it gets really dark so you will be probably be heading out in the daytime. What to expect You'll be in a boat seated the whole time, with space for a backpack. The lake is very calm so using camera gear is no problem as long as you keep your gear accessible. Just be careful getting in and out of the boat. Amazing 360° view means the wider your angle, the bigger the shot. Useful Accessories A polarizer will bring out the most detail and color out of the lush foliage and radiant sky. 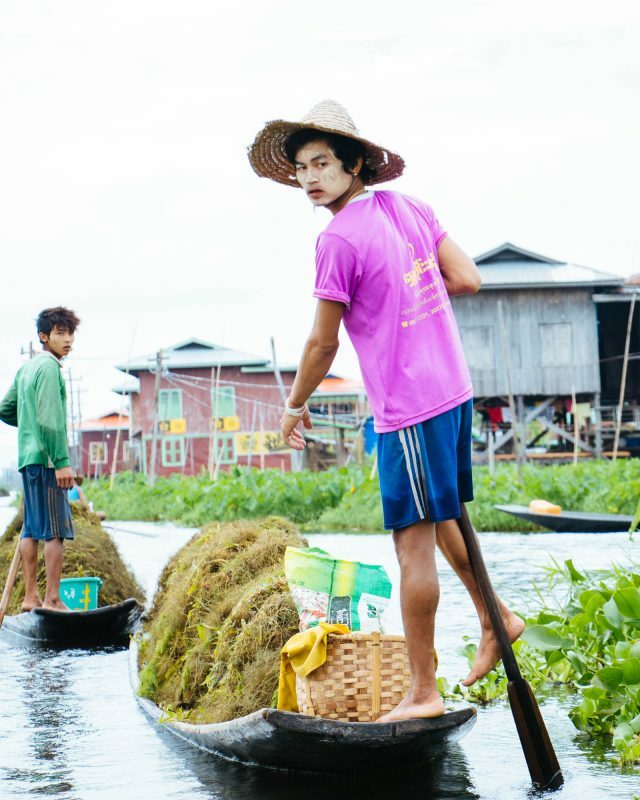 The first thing you see are the fishermen of Inle Lake, who row using one foot to propel the boat. It sounds pretty exhausting but they are so used to it, they make it look somewhat effortless. This young man was especially graceful. I took a couple of shots and had a tough time deciding which one I liked best. You want to overexpose on these shots. The lake reflects the bright sky and all that light tells your camera to reduce the amount coming in through the aperture. But it will turn the fishermen into almost-silhouettes, so you need to compensate by overexposing by at least one stop. That way you’ll be able to capture the details in your subject a lot better. Many of the young men are actually collecting lake weeds as you can see here – they use them to build the floating gardens. 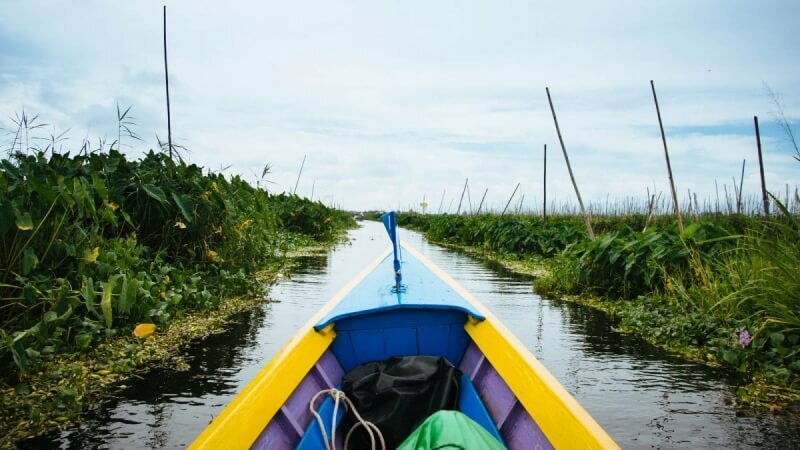 We boated down pathways through these floating gardens – it was really relaxing and also overwhelming to see the 360° of beauty and sky and lake. The pathways function a bit like water highways, there’s even “traffic” at some spots! The monsoons had moved a lot of the plants when we were there, and we actually got lost in the lake at some point. Pro-tip: Google Maps does not help you here. Ask for directions. Along the way we visited temples, blacksmiths and silversmiths that were all located on stilts along the river. Try to get wide angle shots as you cruise by, close to these structures, especially if you have a dramatic sky. You’ll also see scenes from the daily lives of the people that live in this amazing place. I kept thinking how crazy it was that they don’t ever walk to their neighbor’s house but instead they boat over. 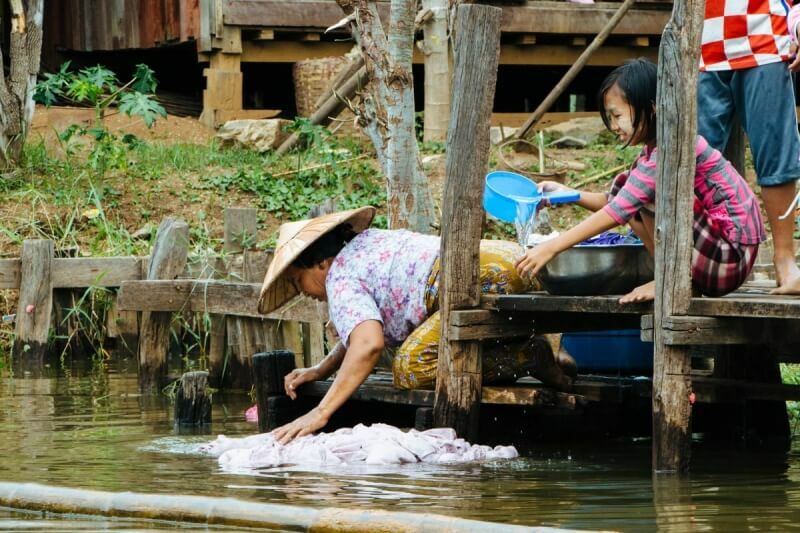 Here a young girl helps her mom wash the laundry. Either that or she’s just messing around instead of helping – like most 12 year olds. You’ll also see women and children bathing in the river but I prefer not to take pictures then – I figure I wouldn’t want someone to do the same to me! With all that water, you have to learn to use it in your shot. Try to watch out for reflections and see how you can use them in the composition. Sometimes, the reflections can add a beautiful symmetry to the shots of the temples. All those spires reflected in the glossy water. I know I’m breaking the rule of thirds here but the reflection makes it worth it. And at times, the temples can be very unsymmetrical as well, like this oddball pagoda. Honestly, at Inle Lake, the hugeness of the sky and lake surrounding me seemed eternal and it’s hard to capture that feeling. Definitely an experience worth having in person. I find that at times, it’s really important to also put the camera away and be in the moment. I can still close my eyes and remember being on that lake. 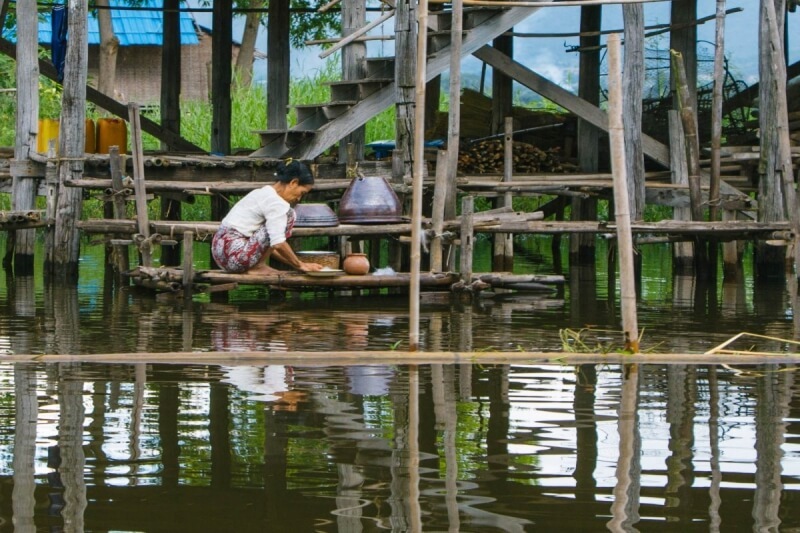 At the same time, I loved the possibilities for photography at Inle Lake. Do not pass this one up! 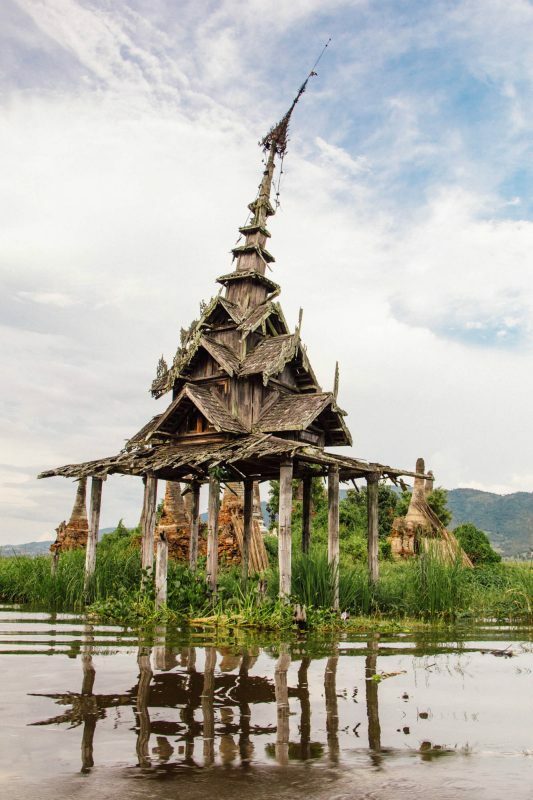 Have you been to Inle Lake? Comment below!